Villagers in rural Olyanytsya, in central Ukraine, are hopeful that village life is about to become a lot more bearable. 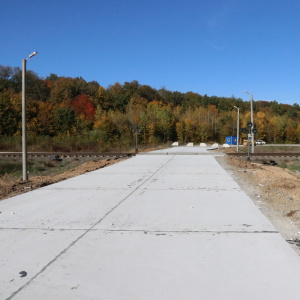 After putting up with intense heavy vehicle traffic from the industrial farming operations of agro-giant Mironivsky Hliboproduct (MHP) for years, the company has finally finished building a bypass road to divert traffic around residential areas. Residents are hopeful that the new bypass will give them some respite from constant dust and smells from passing trucks, growing pot holes and vibrations so strong they have caused cracks in nearby homes. Beyond that, many villagers are still waiting for deeper action to address other ongoing impacts and fears about the air, water and soil pollution from MHP’s industrial farming activities. MHP’s intensive use of local roads is connected to the sheer size of its operations. Its local Vinnytsia Poultry Farm currently includes over 450 chicken houses, which hold over 17 million chickens at a time. It also leases 25,000 hectares of local farmland, on which it grows grains to feed the chickens. Until now, the main road through Olyanytsya has been a primary transit route for MHP’s chickens, chicken parts, manure, fodder, waste water and other cargo between the buildings of its intensive poultry farm. Since construction of the farm began in 2010, this road has served as the most direct route between MHP’s manure storage facility and half of its local chicken houses on one side, and its hatchery, slaughterhouse, fodder plant, waste water treatment plant and remaining chicken houses on the other side. Now, MHP has begun construction on an expansion of the farm, which will double its size. MHP has boasted that the Vinnytsia Poultry Farm is the largest poultry farm in Europe. The traffic problem was documented in a 2017 video. Villagers complain that the size and weight of MHP’s agribusiness vehicles has caused damage to the road and surrounding properties, which were not built with the expectation of having to sustain vibrations from so many passing trucks. Houses near the main road now have noticeable cracks in their walls and roofs, which were not present before the arrival of MHP. 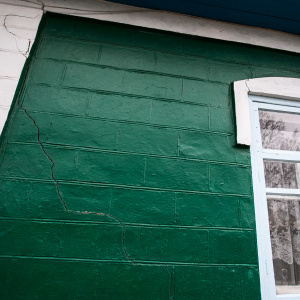 These cracks are seen consistently in houses bordering the road, regardless of when they were built. MHP road use has also led to noise and dust pollution, as well as strong odors from vehicle cargo, causing a constant nuisance for local residents. Matters are made worse by the speed of passing trucks and lack of effective speed control and road safety measures, causing a safety concern for local residents who frequently walk along the roadway. A November 2017 study of traffic impacts set up a video camera to collect footage of vehicles traveling on the Olyanytsya main road over a 7-day period. Through visual observation and by cross-referencing the vehicles shown in the video against the vehicle types registered to the company, the study found an average of 400 heavy vehicles (weighing 3.5 tonnes or more) traveling on the road each day that were either distinctively or likely related to MHP’s operations. This means that vehicles related to MHP accounted for approximately 70% of all heavy vehicle traffic. This is likely an underestimate, as the study only counted vehicles traveling during daylight hours and only those types of vehicles that are registered with MHP, not its contractors. The bypass road opening comes after years of complaints and protests by local villagers, dating back to 2010. In 2015, MHP responded to these concerns by developing a draft plan to build a bypass road. Over the following years, the project suffered from repeated delays, even while MHP’s huge expansion of the Vinnytsia Poultry Farm has continued at pace. In 2016, the local government administration established a commission of experts to investigate and identify the cause of damage to local residences along the road. The commission found “massive damage to building structures” and found that road use by heavy vehicles, speeding, and breaking and accelerating during traffic were among the primary causes of the damage. Local community members have also held a number of protests about the traffic issues, including an event in September 2017 in which villagers from Olyanytsya blocked the road to all traffic. Most recently, in June 2018, villagers filed complaints to the accountability offices of two public international banks that provided financing to MHP’s operations in Vinnytsia region, the International Finance Corporation and European Bank for Reconstruction and Development. These complaints detailed the impacts from MHP’s Vinnytsia Poultry Farm and Zernoproduct Farm. They requested a dialogue process with MHP to discuss community concerns and negotiate solutions directly with the company. Now, eight years after villagers first began to raise their voices, the bypass road is finally complete. Villagers see the new bypass road as a welcome first step in resolving traffic issues linked to MHP’s operations, but for them, the bypass road was long in coming, and cannot be a stand-alone measure. The bypass road will only make a difference if it is consistently used by MHP employees and contractors. The Olyanytsya main road will still be the most direct route between many MHP facilities, and any significant and lasting reduction in heavy vehicle traffic through the village will require MHP to impose and enforce a policy requiring use of the bypass road rather than the road through Olyanytsya. MHP also has a responsibility to address the past impacts of its constant road use over many years, which has left the road in a bad state of disrepair, full of deep and growing potholes, and caused damage to local homes. Additionally, while traffic impacts to Olyanytsya have been particularly severe, it is not the only village that has suffered impacts from MHP’s operations. Other villages have also had to put up with impacts from heavy vehicle traffic and foul odors and dust from MHP’s chicken rearing, slaughtering, and grain production facilities. Local villagers throughout the area also fear other impacts, such as pollution to local air and water, and to the region’s prized fertile soil. The complaint submitted to MHP’s international financers has now been found eligible and local villagers will begin negotiations with MHP in earnest in the coming weeks. The bypass road is a positive step that local villagers hope will signal the start of a genuine process to develop solutions for the many challenges of living next door to Europe’s largest poultry farm. Yet with MHP’s expansion already underway, the company must address the concerns of local villagers with more urgency and make concrete its commitment to sustainable development and responsible business practice.